We traveled to West Africa in October, 2013. 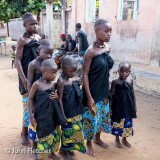 This gallery includes images from our visit to Benin. Other galleries include images from Togo and Ghana. Many thanks to our guide, Noah, our driver, Koffi and Geographic Expeditions for a fascinating journey. Click on a thumbnail to see the full image. All images are best viewed on "Original" size. A slideshow is also available for each gallery but only the image title will be shown. My commentary, if any, will not be shown. Click on the "Images of Daily Life" gallery to reveal its thumbnail images and slideshow.